Looking for a quick and easy pork tenderloin recipe? 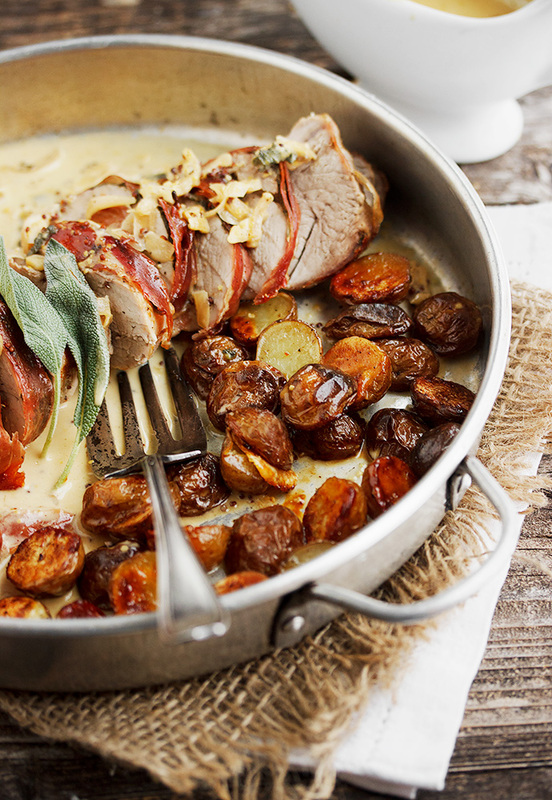 This delicious Prosciutto Wrapped Pork Tenderloin fits the bill perfectly! Add some potatoes to the pan for a great, one-pan meal. 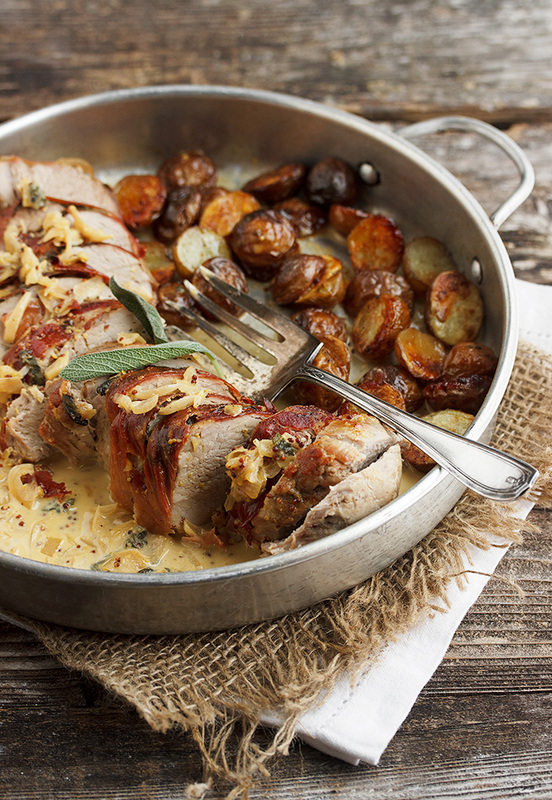 Seriously though, the addition of prosciutto to a simple pork tenderloin is a great way to elevate a simple “meat and potatoes” dinner. The prosciutto adds not only flavour, but a bit of saltiness and crispiness to this dish And of course, it keeps the pork tenderloin extra moist. Tucked underneath the prosciutto are a few sage leaves, for even more flavour. 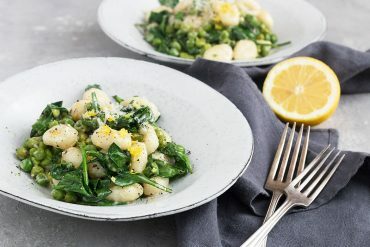 Simply cut up some potatoes and throw them in to the pan, pop it all in the oven and in 30 minutes, you’re ready to eat!. 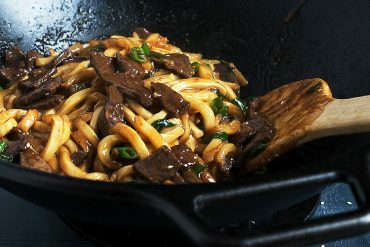 If you’re a sauce lover like I am, you can take it one step further and make a quick pan sauce, as well. My sauce features shallots, cooked with both grainy and dijon mustard, chicken stock and some chopped sage, finished with just a splash of heavy cream. If you’re avoiding dairy, simply skip the cream and add 2 tsp. of cornstarch (or arrowroot/tapioca starch) to the chicken stock before adding to the pan to thicken the sauce a bit. I do recommend fresh sage for this one. If you don’t have (or like sage), fresh rosemary, thyme or tarragon would be nice, instead. 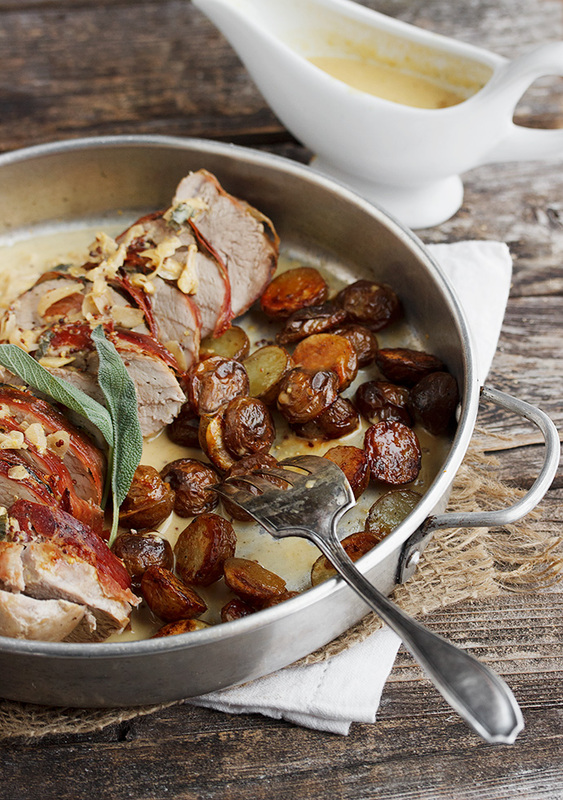 Looking for more pork tenderloin recipes? Pork tenderloin gets a Thai spin with my Thai Green Curry Pork Tenderloin, or try this easy Maple Mustard Pork Tenderloin. The Fall and Winter months are perfect for my Cranberry Balsamic Pork Tenderloin. Enjoy! 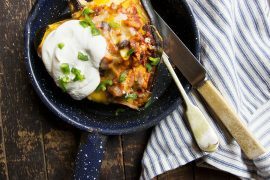 A quick and easy one-pan meal that is ready in just 30 minutes! I've included an optional shallot/mustard pan sauce if you'd like to step it up a notch. Pre-heat oven to 425° with rack in centre of oven. Remove fat and silverskin from pork tenderloin. Tuck thin end of tenderloin underneath. Place sage leaves on top of pork, evenly spaced along the meat. Add some freshly ground pepper BUT DO NOT SALT! (The prosciutto will take care of the salting here!). Take one piece of prosciutto and lay it over-top of one of the sage leaves, tucking the ends underneath. Repeat with another slice of prosciutto, being sure to cover the sage. Use 2 or 3 slices of prosciutto as needed to cover more of the pork. 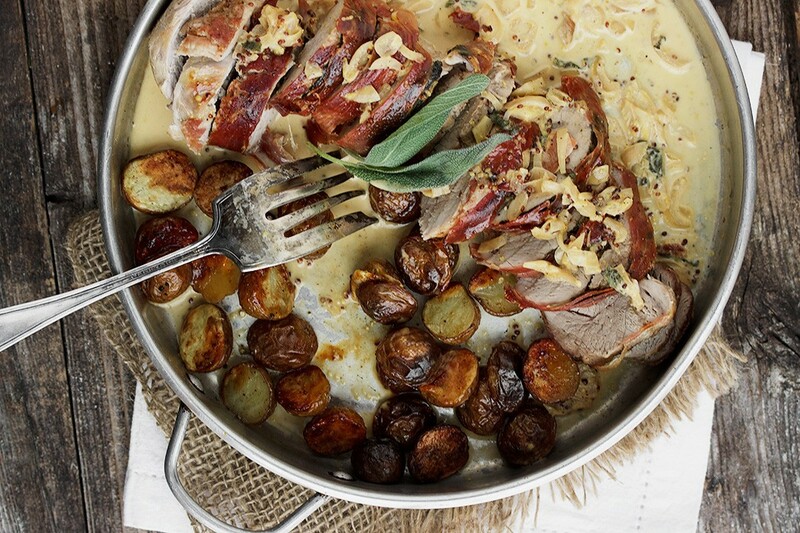 Place pork in the centre of an oven-safe skillet or baking dish. Brush the top of the pork/prosciutto with olive oil and brush the empty sides of the pan with olive oil as well. Cut potatoes in half and distribute on either side of the pork. Try not to over-load the pan or the potatoes won't brown as well. Sprinkle with a bit of salt and pepper and if desired, arrange the potatoes cut-side down in the pan for best browning. Place in to pre-heated oven and cook for approximately 25 minutes or until internal temperature of meat is about 150° (time will depend on the size of your tenderloin). When meat has reached this temperature, remove from oven. Move rack up one position and turn on the broiler. Place skillet back in the oven and allow to cook under the broiler for a few minutes until the prosciutto crisps up. Remove from oven and let pork stand for at least 5 minutes before cutting/eating. 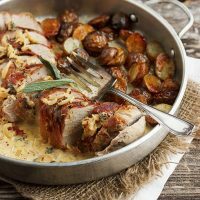 If making the pan sauce: Remove pork to a cutting board and tent loosely with foil and using a slotted spoon (to keep as much of the pan juices in the pan as possible), remove the potatoes to a bowl. Set aside. Place skillet on to a burner, over medium-high heat. Add the wine and shallots and using a wooden spoon, scrape the bottom of the pan to loosen any browned bits. Cook until shallots have softened and are starting to take on a golden colour and wine has mostly evaporated. Add chicken stock, mustard, sage and cream and allow to cook, until reduced by 1/Taste and add salt and freshly ground pepper, to taste. Serve over pork or on the side. *Note: If you are avoiding dairy, simply skip the cream and instead, add 2 tsp. of cornstarch (or arrowroot/tapioca starcto the chicken stock before adding to the pan. Cook until sauce thickens slightly. Made this tonight with Brussels sprouts instead of potatoes and it was delicious. Thank you for a simple and delicious recipe! Hello! LOVE your food blog, its my go too for many dinners. I was wondering how you got these potatoes so very crisp and brown? I made this tonight and it was a big hit. We had some young picky eaters at the table and they even had seconds. The potatoes needed to cook longer but I did crowd them a bit. I think next time I will keep them separate so I can give them more attention. 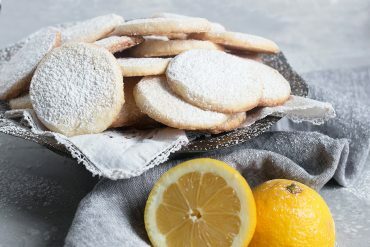 Thanks so much for a delicious recipe! So glad you enjoyed this Kelly and yes, you can absolutely cook the potatoes in a separate pan :) Thanks! These looks so delicious and makes me welcome fall with open arms! Made this for dinner tonight, and just had to comment! 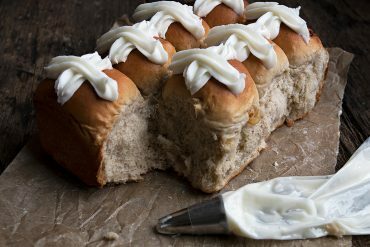 Gorgeous, easy, and delicious recipe! The pan sauce is a must – so good! So glad you enjoyed it, Gina :) Thanks for coming back to comment! I substituted a chicken breast that I pounded out and rolled with cheese inside. It was wonderful although my husband thought I used too much sage. Agreed on the salt — be careful. 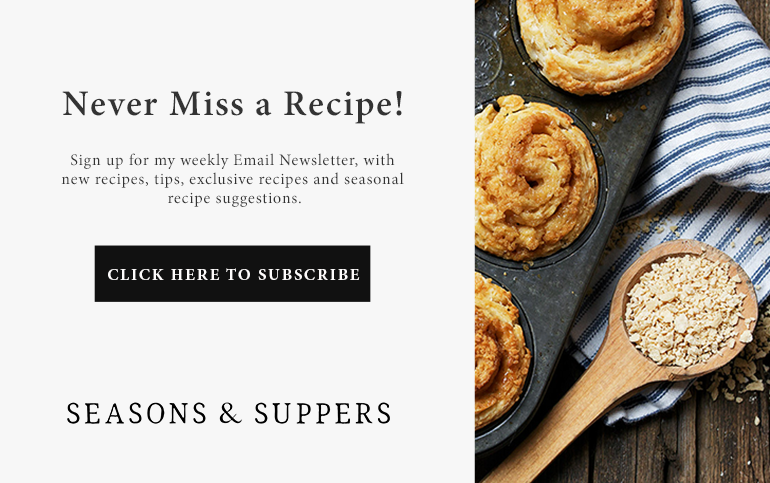 We enjoy trying your recipes new to us. Please keep sending them our way! Sounds delicious, CJ. Sage is a powerful herb, I’ve learned. Hard to find the sweet spot, but yes, prosciutto is seriously salty meat! Your husband is one smart man! Very eloquent if you ask me! Your pork and chicken skillet dishes always make me drool, Jennifer! Thanks so much, Julia. 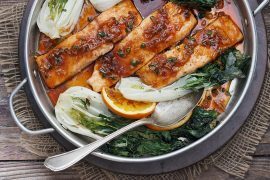 This was a delicious, quick and easy dinner! 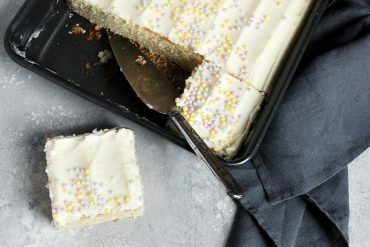 What a gorgeous one pan meal! Love the crispy looking potatoes! I just discovered your blog and wanted to stop by to say that I love it ( your photos are beautiful). 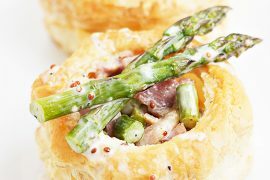 This pork recipe is mouthwatering! You are the queen of sauces Jennifer, I want to dive right into this pan…and where did you get those miniature potatoes?? I am sauce addicted, Sue :) And as for those potatoes, when I went to find some baby potatoes, I found this bag that had the teeniest ones, which I just had to have!